After eight seasons, the thing Supernatural does best is build on the consistent characterization of the two brothers. It is what keeps me watching. Dean did a very bad thing. He allowed Sam to be possessed, actually tricked him into accepting Ezekiel, when he knew Sam would never do it if he knew the whole story. That’s bad. It’s really, really awful considering Sam’s past experience with angel possession. But is it out of character for Dean to do this? I don’t think so. Dean can be selfish. He can be bossy. His life-long feeling of responsibility for Sam often gets blurred into a feeling that he can override Sam’s decisions. It’s not that unusual, even for people who have lived normal lives. I find it understandable that Dean handles his extreme feeling of responsibility by feeling entitled to be overly controlling. And he knows he’s doing it, that’s why he gets angry and defensive when Sam resists his control. Some fans have argued that Dean made this decision because he can’t live without Sam. There has been much discussion of the line, “There ain’t no me if there ain’t no you.” I don’t think that line, even if spoken by Dean (which I’m not analyzing here) literally meant that Dean could not live without Sam. Dean doesn’t want to live without Sam, certainly. But he can. He has. He’s just not going to if he can help it. Dean feels a sense of ownership of Sam. I don’t mean that in a creepy way. It’s not normal, but it is understandable, considering the way they grew up. Dean has lost so much. When Sam died in “All Hell Breaks Loose” Dean exposed his raw feelings by yelling at Bobby, “You don’t think I’ve paid enough?” Even then, Dean was sick of losing people he loved. And he’s lost many more since then. Dean is the brother who makes connections with other people. I have often said that Dean loves the whole world, while Sam only loves Dean. 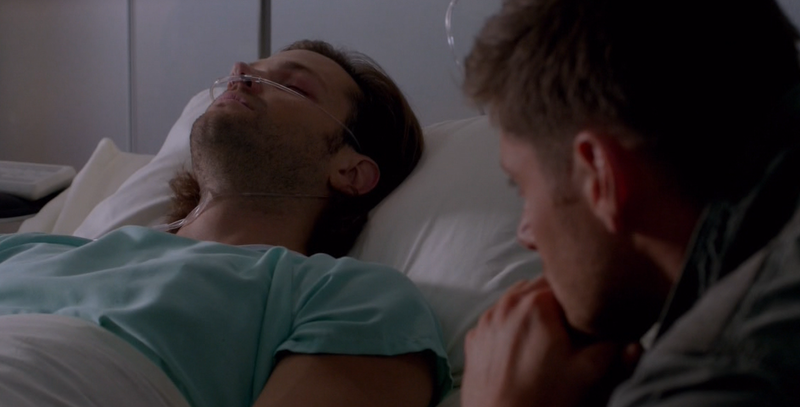 I’m not saying Sam doesn’t feel it as deeply when someone they love dies, but Dean acts as a buffer for that loss. He’s still protecting Sam emotionally after all these years. There is no such buffer for Dean. So Dean will have to deal with the consequences of his selfish, bad act, just like Sam did when he knowingly did bad things for good reasons. What those consequences will be will determine, for me, if this story-line succeeds. Sam is, after all, a grown man. A person in his own right. He has a lifetime of experiences, he’s smart, he’s capable. In spite of his flaws, he has earned the right of self-determination, and the way Dean has violated that is breathtaking. Some discussion of the episode I have read speaks of Sam being suicidal. He was not. He agreed in the church that he would live, he would give up the trials – he would let go of all the suffering and preparation (yes, and purification) that the trials entailed – give up on closing the gates of hell forever. Because Dean asked him to. Dean wanted him to live, so he gave all that up in order to live. But he was fatally injured. There was no recovery, the doctor said. Only machines keeping him alive for a while. And this was amply demonstrated by the fact that his reaper came for him. Reapers don’t just drop by to chat. Tessa explained the consequences of not going with your reaper when your body is done and it’s time to go, and they are not good. In 2.01, Dean was about to make the same decision Sam made when faced with similar circumstances. But, yes, I know. Winchesters. Co-dependent. TV show. Fictional. But being fictional and having convenient supernatural intervention does not absolve Dean of the requirement that he respect his brother’s humanity and autonomy. What he has done to Sam, especially after all they’ve been through, and especially knowing Sam better than anyone in the world, is a terrible violation. We’ll see if the show treats it as such. Previous Post Tiny organization victory. Good review! This was like a brother recap. I enjoyed it! What did you think of episode two? I’m sorry you’ve lost family to cancer. It’s painful. Thanks for sharing. Thanks for commenting! Sorry I’m late responding, I thought I posted and then it disappeared! I posted my thoughts on episode 9.02 in a new blog entry. I have lots more to say, but I don’t want to come off as raging at Dean. I did watch the spoiler clip for 9.03, too. I’m anxious to see more.